FTSE100 `continues to trade higher for 5th consecutive day following more than 50 points jump yesterday. The index is trading higher following footsteps of US market. S&P500 has broken 200- day MA after a long consolidation and closed well above that level for 2nd consecutive day. The index has jumped more than 450 points from minor bottom 6733. The weak pound sterling also supporting the index. Cable has lost nearly 150 pips from the high 1.29935 and shown a minor recovery.The index hits intraday high of 7223 and is currently trading around 7167. The index’s minor support is around 7140-43 97- day MA) and any violation below will take the index to next level till 7105 (10- day MA)/shown a minor jump. 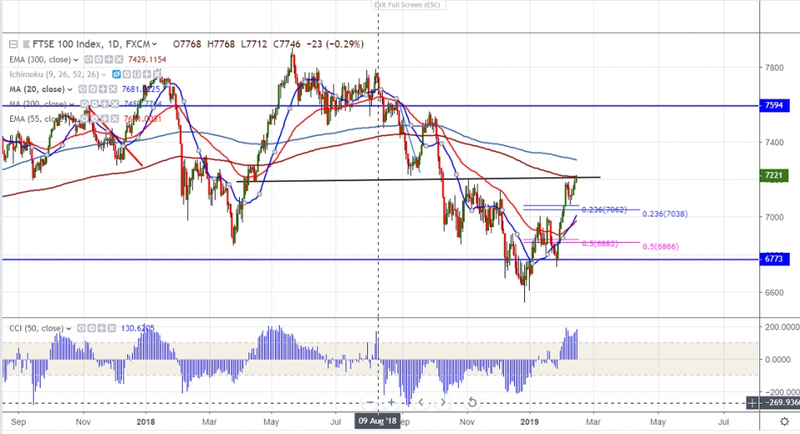 Any weakness in the near term can be seen if FTSE100 trades below 7038 and any violation below targets 6959 (20 day MA). Any close below 6960 confirms further weakness and a dip till 6900/6833.Major bearish continuation only below 6733 level. On the higher side near term resistance is around 7200-7220 (300- day EMA) any break above confirms bullish continuation and a jump till 7300/7560 is possible.